Ever wanted to do an in-depth study of the ten commandments? Now you can! 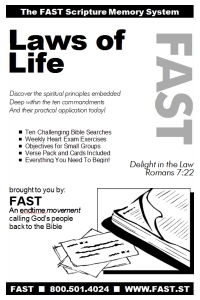 Our challenging Laws of Life course digs deep into the spiritual principles embedded within God's Law, and looks at how they play out in our day to day interactions. Discover the root causes of pride, shame, fear, bitterness, rebellion and more. It's all there--the secrets to a life of excellence. God's Law is a perfect transcript of His character. Christ came to magnify the Law and make it honorable. And now you too can understand more fully what it means to have God's Law written in your heart! A great follow up course to the Moral Machinery.